Wilkins RV is excited to be celebrating National Outdoor Month, going on new through the end of June! We are offering some fantastic promotional deals to help get you and your entire family ready for the summer RVing season. While some people are alive in the great outdoors, others may need a little “persuasion.” Well, this month at Wilkins RV, we’ve got that! 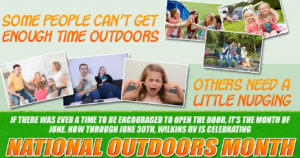 Wilkins is Celebrating National Outdoor Month! Our promotional deals include a free gift with every new purchase in the month of June! Not to mention the free hotdogs, snacks, sodas, and fun every Saturday! You aren’t just coming in to shop for an RV, you are coming in to experience the fun that the RVing life has to offer. New travel trailers, starting as low as $114/month! New fifth wheels starting as low as $241/month! New fifth wheel toy haulers starting as low as $294/month! New motorhomes starting as low as $398/month! And so much more including our certified pre-owned RVs with even lower prices! You won’t believe the amazing deals that we have and the culture of summer RVing fun that we are dedicated to displaying here at Wilkins RV. We are even offering a fantastic price on our 2016 Newmar Canyon Star, complete with handicap-accessible features. Stop by our dealerships in Bath and Churchville to see some of the outstanding deals that we are offering this month for National Outdoor Month. You will not want to miss these summer deals! What a great way to open up your new RVing season than with one of these new and pre-owned RVs that are certain to bring your entire family years of outdoor fun! Contact us today for more information or just stop on by!